Frames to be repeated by a local area network simplex packet repeater also contain a third address field following the FMCALL field. This third field is the callsign of the repeater. More details on this protocol will be published in the revised AX.25 document. Collectively, the group considered nearly every design which starts out with a statement something like this: "Holy 807's, look at all the overhead bytes you have in using call sign addressing. I can do it with just 4 bits." We have found that these other schemes have their own defects and that the penalty for the call sign overhead is relatively small in comparison to other delays on the link and in view of the other benefits. The AMICON session ended with promises from various members to try to implement the required versions of this new protocol. 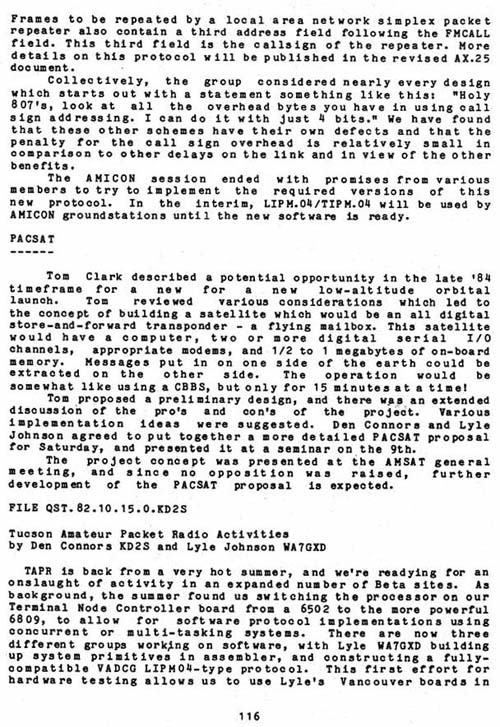 In the interim, LIPM.04/TIPm.o4 will be used by AMICON groundstations until the new software is ready. Tom Clark described a potential opportunity in the late '84 timeframe for a new low-altitude orbital launch. Tom reviewed various considerations which led to the concept of building a satellite which would be an all digital store-and-forward transponder - a flying mailbox. This	satellite would have a computer, two or more digital serial I/O channels, appropriate modems, and 1/2 to 1 megabytes of	on-board memory. Messages put in on one side of the earth	could be extracted on the other side. The operation would be somewhat like using a CBBS, but only for 15 minutes at a	time! Tom proposed a preliminary design, and there was an	extended discussion of the pro's and con's of the project. Various implementation ideas were suggested. Den Connors	and Lyle Johnson agreed to put together a more detailed PACSAT proposal for Saturday, and presented it at a seminar on the 9th. The project concept was presented at the AMSAT	general meeting, and since no opposition was raised ,	further development of the PACSAT proposal is expected.